2019 Race Season Pringle 1st, Peebles 2nd,Bailey 4th, Schweitzer 4th, Smith 5th, All find victory lane! Week #15 had 6 divisions in action at “Thunder in the Valley”, presented by Ferris Chevy. Drivers, Fans, and Crews were treated to a good night of racing. There were 65 cars, trucks, and dwarfs that made it to the 3/10th mile oval. First feature of the evening was the Summit Racing Equipment Modifieds. Jerry Devore in the #4 and #67 of Bob Page set the front row for the 25 lap feature. Page was able to use the outside lane and pull ahead of Devore. Lap 2 seen the first caution as Devore over drove into turn three, spinning on own. Jason Grewell in #99 and Mack Gribble in #12 were in the wreck. Grewell had to go pit side as he had a left front flat. Green would come back out with Page and #65 of Dan Harding but a quick caution as #2 of Lee McCreery would spin on own off turn two. Page and Harding went back at it on the restart. Page was able to take lead but had new challenger in Bailey in second spot. Bailey would lead lap four but caution would wave into turn 3 as Page got into Bailey spinning at bottom of three. McClintock would check up and McCreery would jump tire going hard into the turn three wall. Gribble also had to pit as he had bumper almost falling off. Bailey and Cox set up for the restart. Bailey would slowly move out as Cox ran second. Michael Stone in the #331 first year racer was racing a pretty tuff competitor in Doug McMillen in the #54 for third. Caution would wave on lap 10 debris on the track. Bailey and Cox set the restart. Into turn three, McMillen got into the back bumper of Cox spinning him in turn three. Bailey and Cox would set the pace once again. Bailey was able to check out slowly. Stone, McClintock, Harding, and Page battled for the third through sixth position. At the double checkered flag, the #55 of Brandon Bailey picked up his 4th victory of the season. Following was Cox, Stone, McClintock, and Harding. Heat wins went to Cox and Derek Grewell. Top Qualifier was Doug McMillen. Buckey Mowing Street Stocks were next to hit the 3/10th mile oval. Dave Marder and Josh Moss set the front row for the 20 lap feature. Marder and Moss got a great start. Marder was edging Moss only by half a car each lap. Moss wasn’t giving up in the high lane. Gabe Pringle in the #7 set pace to try and get to front. Pringle battled with moss for a couple laps for second as Pringle was final able to clea Moss for second. Grove was following in the shoes of Pringle. On lap 5, Pringle looked to the outside and made the move to lead lap 6. Marder was making Pringle work in the outside but Pringle was able to move to front. Grove and Moss followed behind Pringle to be in the top 3. Grove was catching up to Pringle in the matter of the next 5 or so laps. Grove was all over the back bumper of Pringle. Pringle slipped up a little of turn two. Grove railed to the inside on back straightaway. Pringle drove in hard on the outside. Grove got a little lose and slide into Pringle. Pringle was able to close door into turn one but Grove was there and spun Pringle out in one and two on lap 17. Pringle and Moss set for the restart. Moss gets a good run on the high side. Pringle and Moss battle side by side till white flag. Grove tried to pass Moss for second but fell just a few inches short. At the double checkered flag, picking up his first feature win of 2018. In the WTUZ, Bear Electirc, Ridgeways Auto Sponsored #7 of Gabe Pringle. Following was Moss, Grove, Marder, and Passwaters Sr. Heat Winner was Pringle. Top Qualifier was Kyle Grove. Middle feature would be the 30 lap McIntosh Oil Company Late Models. #24 of Nick Grubbs and Bob Schneider Jr in the #17 was on the front row for the feature. Schneider would use the outside and take the race lead off turn two. Stankiewicz would follow directly in toe with Schneider to the front. Nick Grubbs goes up track on front straightaway and closes door on Rich Rohrer. Laps 3, first caution as Rohrer gets into the back on Grubbs into turn one. Schneider and Stankiewicz were set for the restart. Stankiewicz would get a good start on the outside but Schneider made him work for it. Schnieder would then try to hold off Bubba Smith and was doing so. Lap 6, seen the next caution as Schnieder drover in deep into turn three and spun on his own. Stankiewicz and Smith went back and forth for the top spot until lap 8, when #69R of Gribble spins on his own in turn two. Smith and Stankiewicz would go back at it as Smith moves to advantage. Schneider was slower catching the duo up front. Bob Eichel in the #69 was definitely putting one of his best runs of the season together. 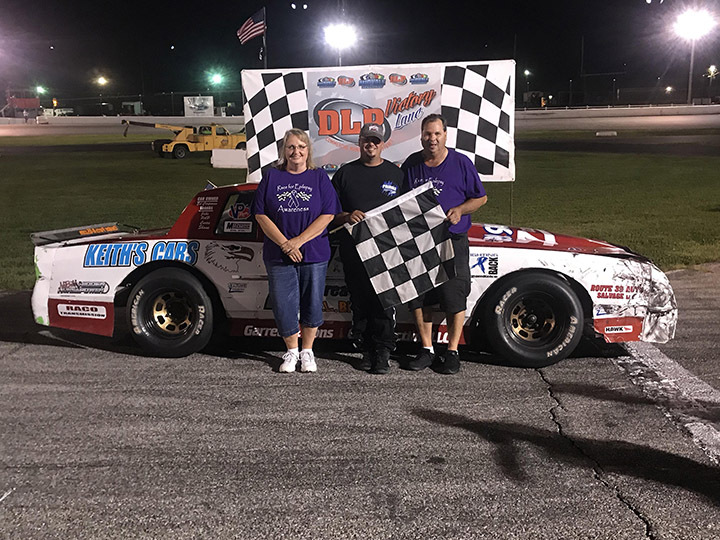 When the double checkered flag flew, the Finish Line Designs, Freedom Finance #12 of Bubba Smith parked it in victory lane. Following was Stankiewicz, Schneider, Eichel, and C.Grubbs. Heat Winner was Bubba Smith. Top Qualifier was Tom Stankiewicz. Next to last feature was the South Philly Pizza Compacts. Savanna Alm in the #7s and #4E of Tyler Eichel set the pace for the 20 lap feature. Eichel used outside to clear Alm into turn one. Eichel would start to pull away just a little bit but Ryan Alm and Toby Cook followed in toe. People on the move were Peebles, France, Renicker, Finlayson, and Buckey. Buckey was able to get up into the number three spot as he passed Cook in lap 5. First caution waved at lap 6, when Toby Cook in the #41 got into a three wide mix and came down on France spinning across France nose was Cook. France had to pit as he had something dragging after the wreck. Green waves as we get back to racing. Eichel and Ryan Alm were up front battle for the lead. Peebles and Finlayson were able to move from 4th and 5th to 2nd and 3rd before the next caution on lap 7. Caution waved for #44 of Andrea Brokaw spinning on her own in turn one. Eichel and Peebles were side by side for the restart on lap 7 but a quick caution would wave as #23 of Carl Phillips goes up track and spins in turn one and two. Eichel and Peebles would set the pace again for a restart. Peebles was able to make the pass on the outside of turn 2 to take the race lead. Finlayson was following behind Peebles and was moved to second. Peebles and Finlayson would go back and forth for the race lead. Each would lead every two laps. Buckey, Fance, and Reniker were definitely trying to close the gap and were doing so as lap traffic came. On the white flag lap, Finlayson had the race lead just by a few inches. In three and four, Peebles pushed up just a little but also lapped cars got in the way. Finlayson had to break a little and helped Buckey and France move up. To the double chereckred flag, picking up his 2nd career victory, it was the T&T Tire sponsored #78P of Josh Peebles. Following was Buckey, France, Finlayson, and Reniker. Heat winners were France and Cook. Top Qualifier was Kyle Finlayson. Heat: Pringle, Grove, Marder, Moss, Passwaters Sr.